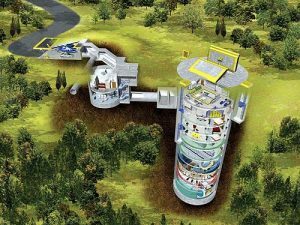 A luxurious underground apartment building is being built in a Kansas missile silo to help protect those who can afford it from apocalyptic events, according to a recent article in the ARP. Developer Larry Hall has plans to build three more silo-shelters if this one sells out. There are 14 underground floors, and seven will be condo space. Each floor is listed for $2 million, but you can get half a floor for $1 million. So far, four buyers have purchased their potential safety. “They worry about events ranging from solar flares, to economic collapse, to pandemics to terrorism to food shortages,” Hall told AFP on a tour of the site. On a personal level, Hall is concerned solar flares will wipe out power grids and cause chaos. He and his family plan to use their bunker as a vacation home if that doesn’t happen in the near future. So what’s it like inside the nuclear hardened shelter? For security, the elevator will only work for matching fingerprints, cameras monitor a barbed-wire fence, and force against intruders can be lethal. You can check out more about the condos at Hall’s website. What do you think of these survival homes? Will you be lining up to purchase one for your family?